It would not be possible to retrieve MS tissue around Australia without being able to call on the resources of the Australian Brain Bank Network (ABBN) overseen by the National Director, Professor Catriona McLean in Melbourne. The facilities that make up the ABBN have been collecting, processing, characterising, storing and distributing post mortem human brain tissue and related samples for the conduct of research into brain and mind disorders for over twenty years. The ABBN is able to retrieve brains in each of the mainland capital cities of Australia and it already has in place the procedures to do this rapidly after death. If you live in a region of Australia that is not a mainland capital city, we will do our best to ensure that your wish to donate your brain is fulfilled. *Donations in QLD will be processed through Pathology Queensland, a pathology service provider under Queensland Health, Royal Brisbane and Women’s Hospital, Herston QLD. 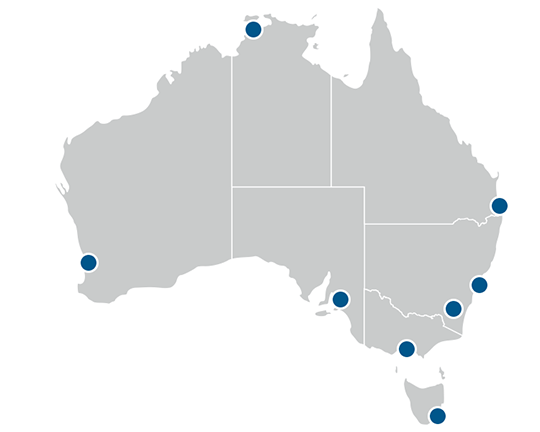 Please note that donations in TAS, ACT, and NT will take place at the nearest participating centre within the state. The Brain and Mind Centre at the University of Sydney, and the Departments of Neuropathology and Neurology at the Royal Prince Alfred Hospital, have each provided extensive in-kind support and infrastructure assisting the operations and neuropathological services of the MS Research Australia Brain Bank in Sydney.